NEW YORK (NEA) -- It's a building set apart from its neighbors in a seedy section of New York's West Side only because it looks a bit newer than the others, because its graffiti is extraordinarily single-minded and because it contains, at certain hours of certain days, Jonathan Frid. 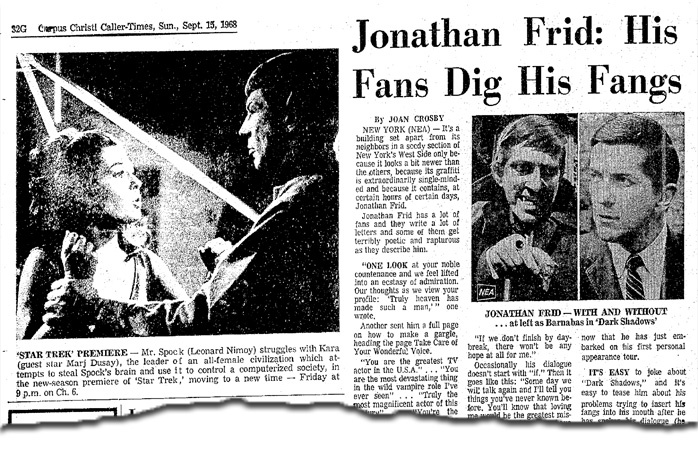 Jonathan Frid has a lot of fans and they write a lot of letters and some of them get terribly poetic and rapturous as they describe him. One Look at your noble countenance and we feel lifted into an ecstasy of admiration. Our thoughts as we view your profile: "Truly heaven has made such a man,'" one wrote. Another sent him a full page on how to make a gargle, heading the page Take Care of Your Wonderful Voice. "You are the greatest TV actor in the U.S.A." ... "You are the most devastating thing in the wild vampire role I've ever seen" . . . "Truly the most magnificent actor of this century" . . . "You're the best-looking, the finest actor in the whole wide world. Such class. Such elegance," others have written. Now it is entirely possible to be an Intelligent, aware television fan and still not know who this paragon of the manly and acting virtues is. Jonathan Frid, for the uninitiated, plays Barnabas Collins, a vampire victim of circumstances and the fury of a witch, on ABC-TV's daytime thriller, "Dark Shadows." thunder and lightning are as important to the show as the actors, and cobwebs make it look as if cleaning women are very hard to find in Collinsport, where the victim lives. Frid also gets to speak a lot of "if" dialogue, as-fraught as it is fruity. "If we fail, this may be the last dawn I ever gee." "If you tell her now, there may not be a tonight." "If we don't finish by daybreak, there won't be any hope at all for me." Occasionally his dialogue doesn't start with "if." Then it goes like this: "Someday we will talk again and I'll tell you things you've never known before. You'll know that loving me would be the greatest mistake you could ever have made in your life." The many plots on "Dark Shadows" move much more quickly than they do on-other afternoon shows. "This is melodrama," producer. Robert Costello says, "and if you think too much about the plot, it falls apart. So it must keep moving." Frid's first experience with slow-moving soap opera gave him a shock he'll never forget. He doesn't recall the exact year, but around 1961 he was cast as a psychiatrist in "As the World Turns." The next day he tuned in to see the program and heard one character saying to another, "I have called in a psychiatrist to help you. He's coming right now." Frid recalls the horror with which he jumped out of his chair and rushed to get the schedule they had given him. "I was sure my first appearance on the show was in exactly two weeks. And it was — it took two weeks for me to rush right over." 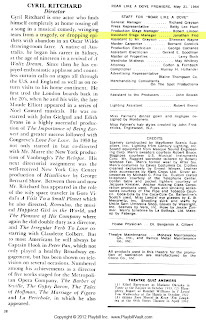 Playbill for ROAR LIKE A DOVE. 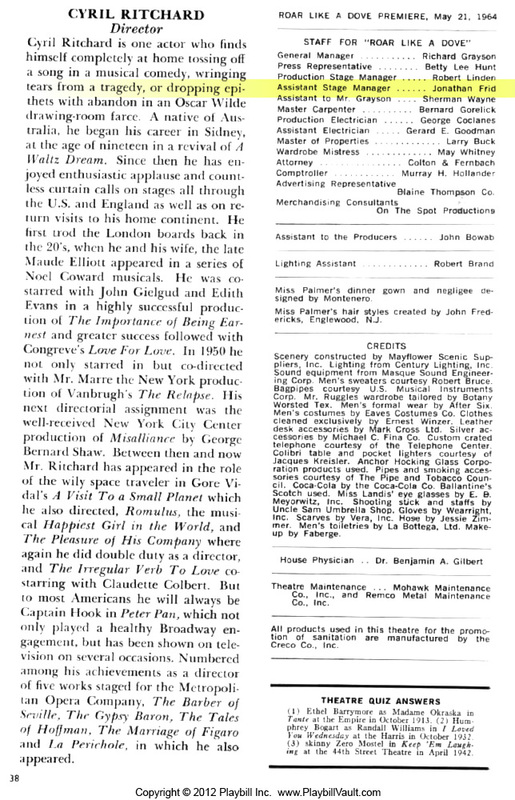 Except for that brief run, a job as Broadway understudy to every actor except Charlie Ruggles in "Roar Like a Dove," a few minor TV roles and a national tour 'in "Hostile Witness," Frid, Canadian born, Shakespearean trained and a graduate of the Yale Drama School, has lacked prior opportunities to become known to the public. He has become so well known to one segment of it now that he has just embarked on-his first personal appearance tour. IT'S EASY to joke about "Dark Shadows," and it's easy to tease him about his problems trying to insert his fangs into his mouth after he has spoken his dialogue (he can't talk when they are in). But Frid says, "I take the role very seriously, of course. I play Macbeth really. He's a man lost, seeking identity with society. It's the most untypical role I have ever had. I have ranged from the young 30s to a very old man. We have never figured the age of the vampire, but he's between 175 and 200 — but not a day older." Frid himself is 43. "Last year I went around telling people I was 44 until my mother corrected me." His feet are still firmly planted on the ground. "All the stuff they call my style is from insecurity. I want to play cool, I want to contain all my emotions. It's only when you are insecure that you project. Part of the charm of the show is the fact that it's amateur night." made a lot of people happy. 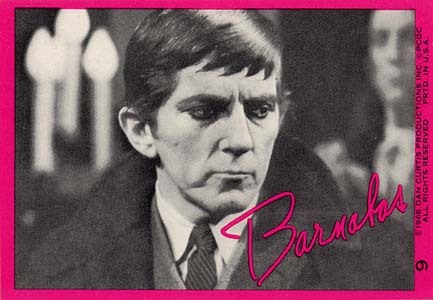 I always knew Frid was growing very tired of it all, even back in 1970, but to not officially end "Dark Shadows" by doing one more movie ("Curse of Dark Shadows") which was to be the 1795 storyline, was rude. He could have been the Byronic, romantic lead, the shattered lover, the heroic destroyer of the villian and then the cursed, suffering,but frightening demon-lover and witness to his family's destruction with a "Wuthering Heights" ending of he and Josette together again in death. It would-have given Lara Parker's acting the exposure she deserved and Jonathan one hell of a resume'. He didn't give his co-workers and friends the chance they needed to expand their careers and the fans, an elegant, Gothic "fare-well keep-sake". So, the following year he was stuck playing a tiny, mute role in a horror TV movie and then the lead in a barely-released, Canadian horror film. Sometimes, an actor has to think of his public and entertain them. Jonathan didn't...and paid the price.